East Asia’s burgeoning importance within the global political economy requires greater understanding of the peculiarities of capitalist systems and their governance within the region. This discussion brings together some of the world’s leading experts on capitalism in East Asia, from the fields of Anthropology and Political Science to consider this, with a predominant focus on the prescient issue of governing financial crises in the region. You can view the full public lecture in three parts here. Annelise Riles is the Jack G. Clarke Professor of Law in Far East Legal Studies and Professor of Anthropology at Cornell, and she serves as Director of the Clarke Program in East Asian Law and Culture. Her work focuses on the transnational dimensions of laws, markets and culture across the fields of comparative law, conflict of laws, the anthropology of law, public international law and international financial regulation. 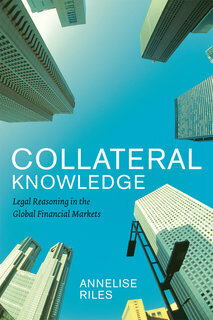 Her most recent book, Collateral Knowledge: Legal Reasoning in the Global Financial Markets (Chicago Press 2011), is based on ten years of fieldwork among regulators and lawyers in the global derivatives markets.